Infestations and invasions often goes unnoticed until it’s too late, and the damage has extended beyond the attic and crawl space into the living area. 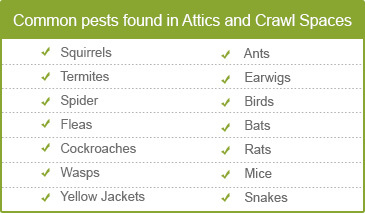 Regular inspection and assessment of your attic and crawl space is extremely important. A close scrutiny of the area will not only help unfold the existing threats, but also shed light on the impending dangers booming in the area. Taking timely action will thus cut the risk of evacuation, lower the extent of damage and help you save on expensive repairs. Here at Quartz Solutions we developed and perfected the art of providing attic and crawl space services that are highly effective. Our trained staff will inspect, monitor and execute the different solutions.We will help you restore your property at the most reasonable cost. Problems thrive in dark and dingy attics and crawl spaces, which can cause damage to the entire premises. Therefore, taking note of issues and addressing them at the earliest is crucial, or else you may have to evacuate your property in order to turn the damage around. Leaking pipes let way for harmful gases. These pollute the entire area and triggers serious breathing troubles. Moisture sets in through broken and cracked ducts. This impairs the temperature mechanism of the premises and inflates energy bills manifold. Mold, mildew and fungus thrive in humid and wet conditions. They also have the potency to spread dangerous infections. Insects like wasps and roaches pose serious health threat. Animals like rats, bats and mice look small and innocuous, but they nibble upon wires, cables and ducts. They also leave behind a dirty mess that is infectious. Pests and termites eat into wood and foundation structure of the property. 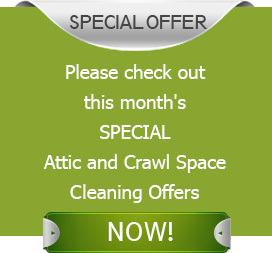 A careful and thorough examination of the attic and crawl space forms the basis of having a clean, tidy and hygienic property.By taking timely steps to clean and upgrade the hidden areas of your home you not only making it safe and functional, but also you are increasing the overall worth of your investment.Undoubtedly, a worthy property is sure to run a long way. Hiring experts for the job is an important decision. The first inspection not only unfolds the actual condition, but also helps prevent further damage. We, at Quartz Solutions, are the undisputed leaders in the field. Our trained staff will carry out the preliminary inspection and put forth a report stating the detailed plan to restore your property to its original condition. We understand the value of your hard earned money.Our attic and crawl space solutions are reasonably and competitively priced and come with no hidden charges. East Rutherford is a small borough in Bergen County, New Jersey.The commanding Municipal Building, the huge Met Life Stadium, the classic Izod Center and the splendid Meadow lands Sports Complex; East Rutherford has much to boast about. Let us help make sure that your home and office are also in mint condition. Our supreme and out class services are leading the industry standard, and we feel it is our way to help the East Rutherford community. Call Quartz Solutions now and schedule your free inspection 201-205-2042.